For better or worse, I’m a child of the nineties, and sometimes a really good Clueless reference is all you need. THIS HOUSE IS A MONET. It looks good from afar, but up close, it’s an absolute disaster. The disastrous-ness has essentially reached comedic proportions, so I guess I could just try to laugh. Maniacally. As I run screaming from the driveway in my bare feet and hurl a filthy white flag into the night. I almost don’t even know where to start. Or where to continue, I guess, since I’ve already touched on a few issues. Maybe something chronological? Okay, so we haven’t had a microwave since we’ve been here. Like, ever, not even for one second. I didn’t bring this up at first because having a microwave is definitely not crucial to survival, and plus I never imagined it would become such a longstanding situation. But we’ve been in the house for three weeks now, and there is still no microwave. Or oven, as it happens, since they go together in this particular unit. Which maybe wouldn’t be such a huge deal, but we STILL can’t keep bread or grains in the house right now because of the moths (more on that later). So here’s where this has become a problem worth mentioning: I can’t even tell you the amount of money we’ve spent eating out. Our kitchen contains some fruit and yogurt in the fridge and a couple things in the freezer…which we can’t cook because, you know, there is no microwave or oven. When Al signed the lease, this cavity was not empty. There was a microwave/oven combination inside — basically the first one ever created (I don’t even think the brand is in business anymore), and it was never replaced, and the microwave literally had a piece of twine wrapped around the handle. Our first day in the house, Al attempted to heat up some coffee. The twine snapped, the button flew off, and we could no longer open the microwave door. Because the entire unit was so old, the property manager was unable to find replacement appliances. The landlord was unwilling to BUY a replacement because of the haul-away and installation costs. Finally, Al offered to locate a replacement, pick it up, wire and install it himself — basically everything except pay for the unit — and we had a deal. It took some time to find. It took some time to ship. It took some time to figure out that we ALSO needed to buy a cable long enough to run from the top of the cavity (note where the hole is in the pic) to the bottom of the unit, since standards for this kind of thing have changed since the dinosaur age. The moral of the story is that there are still no functioning appliances. While we’re discussing appliances that are non-functioning, all of our toilets have suddenly started to clog simultaneously even with nothing in them. Two squares of toilet paper, max, and they’re all ready to flood. Sometimes plunging helps, sometimes not. It’s possible that there’s something wrong with the main line, but we haven’t bothered our property manager with that yet. Because, you know, no big deal. We’re working on it. We’ll get there, because these are the things that are fixable. Right? 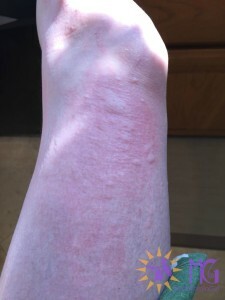 For days, the itching was so intense that I literally scratched sores into my skin. It was like the worst case of chicken pox ever — even though the incessant scratching hurt, I COULD. NOT. STOP. Pain was infinitely more tolerable than the unbearable itch. Eventually, though, I noticed that it would subside a little as soon as I left the house. After a few more hours of research, I asked Al to examine the furnace and blower in the garage for signs of an indoor air issue. “The property manager promised the HVAC system was okay before I signed the lease,” Al said, but he humored me. Our property manager is responsive, but he sure doesn’t seem to know much about property management. 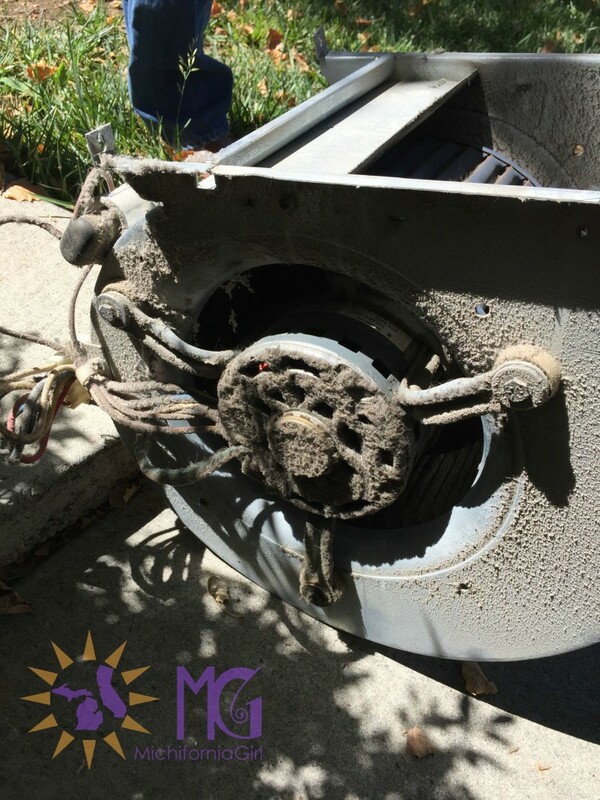 He had no idea that the filter had been improperly installed for years, asked if it was “really that bad,” and told us to just go ahead and hire a company to clean the air ducts. All right, sir. Don’t mind if we do. Our blower (a.k.a. this is what we were sucking into our lungs for weeks). When the air duct guys removed our blower to clean it, they said it was one of the worst they’ve seen. Property Manager was standing right there for that, and he’s been acting pretty weird ever since. It’s like he can barely look at me. He couldn’t get away from us fast enough. In fact, Al was ultimately responsible for locating a new filter and trying to scrape up the missing furnace parts (a retainer, specifically, which he couldn’t find — eventually he just made one). My itching has improved a lot since then; it’s not one hundred percent better, but we’ve only had clean air for a couple of days. Hopefully it’s just taking its sweet time to cycle itself out of my system. That night, as we finally sank onto the couch and tried to relax, I glanced up for a second. In the corner of the ceiling, where our lone living room lamp shines its light, I noticed several near-transparent dots moving together as if in a cloud. More particles of dust? We grabbed the stepstool and Al went up to investigate. Nope…not dust. BABY SPIDERS. Literally DOZENS and DOZENS of baby spiders. As Al approached, the cloud began to scatter all across the ceiling. Something had obviously just hatched, and this is the thing that makes me crazy: was that hatching thing INSIDE? How could I have missed a sac of spider eggs with all of my obsessive cleaning? Or was it outside, and the house is so poorly sealed that all the babies just marched single-file toward the warmth of our lamp via some crack in the baseboard? Mama Spider, where are you? Where are you laying your eggs? WHERE DO WE NEED TO CAULK? As we frantically chased down thirty baby spiders, I finally did laugh, because this is INSANITY, folks. This is not my life. 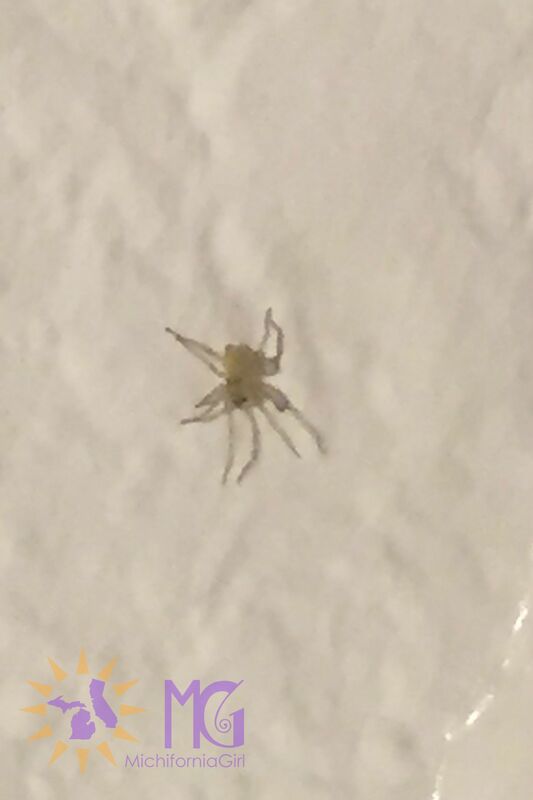 My life is in Michigan where I have a clean, uninfested home and a grassy backyard and family and friends and a single spider who lives in my bathroom because we have an understanding that he will not procreate. 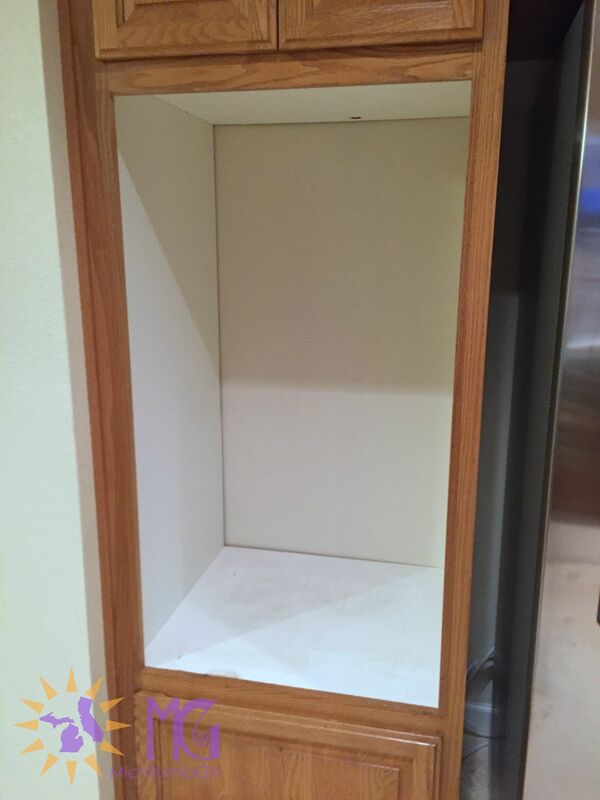 Speaking of problems that I don’t know how to fix, our pantry has been empty for over a week now. Totally, completely, absolutely empty. There is literally not one grain of rice. Our cookbooks and paper products are still taking up every inch of kitchen counter space so we could bleach the pantry again, and spray again, and set out fresh moth traps. The pantry door is kept closed. We spread diatomaceous earth onto every shelf and dusted it all along the floor. AND STILL, once an evening, we burst into the pantry and surprise three new moths that have somehow snuck out of hiding from somewhere. Where are they coming from?! This, guys. This is our EXACT experience. Does anyone know how to fix this problem? I have read every link that exists on the Internet, so if you have a magical solution, I’m ready. At what point do we hire pest control (on our own, since Property Manager already told us he would not be springing for that)? At what point do we rip out the shelves to find their secret moth lair? I’m not even a fabulous cook, so I never thought I would say this, but MAN would I love to be able to use my kitchen again. Melissa Bowers is a high school teacher from Michigan who (reluctantly) moved across the country when she was six months pregnant. Her days used to be filled with great works analyses and discussions of intricate film and literary techniques, but they are now consumed by a curious 3-year-old, a spirited kindergartener, and the desperate urge to write ALL THE THINGS -- which generally occurs a paragraph at a time whenever the children happen to nap. Since moving to California, her work has been published by Writer's Digest and The Writer, and her articles are regularly featured on The Huffington Post, Scary Mommy, and others. Word……We keep bread in the fridge. That said, I really feel for you. Wish I could help. Have you tried a crock pot? Great idea! We installed the microwave and oven combo a couple days ago, too. Yippee! Things are looking up.